The longleaf pine forest—which inspired NewSouth young adult novelist Roger Reid in the writing of his book Longleaf—is central to the mission of a small but dedicated group of folks at The Longleaf Alliance. Their goal is to educate about the importance of the longleaf pine ecosystem. Little known to most people, the longleaf pine forest was once very mighty. Prior to European settlement, it dominated the southeastern United States, occupying a vast 93 million acres. Greatly reduced in size today, the forest is still home to 900 plant species. A longleaf ecosystem maintained by prescribed burns is one of the most ecologically diverse in the world (riveling rain forests), and is home to some of the most rare and unique plants and animals on the North American continent. 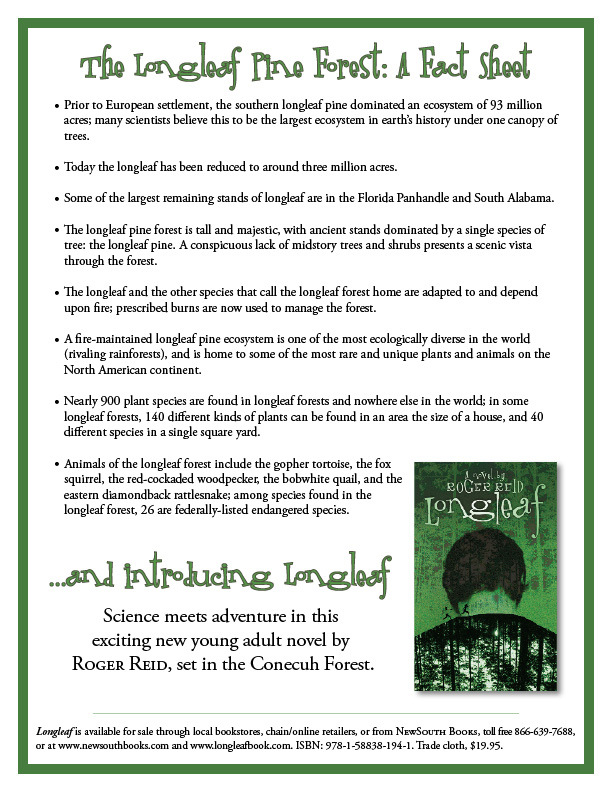 Roger Reid’s young adult novel Longleaf, which is chock-full of such facts about the forest, has proven an invaluable aid to The Longleaf Alliance’s educational outreach program. Reid brings the forest to life, advertising its wonders and its dangers, through the eyes of two likable teenaged protagonists. Longleaf is both an important learning tool and a guaranteed gripping read for adventure lovers of all ages. Download a Longleaf Forest Fact Sheet. Anyone who would like to sponsor distribution of Longleaf can contact Mark Hainds of The Longleaf Alliance at 334-427-1029. NewSouth Books made a promise to Alabama’s beloved storyteller Kathryn Tucker Windham. We promised we would do everything we could to make book lovers and librarians and bookstores and educators aware that her illustrated children’s book, Ernest’s Gift, was back in print. 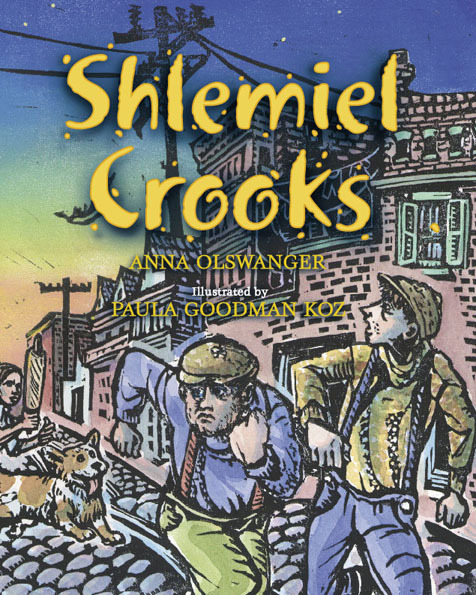 This charming and poignant volume, for readers ages 6-10, tells a very special Alabama story. And we want you to know that this delightful book is once again available for purchase. Harper Lee calls Ernest’s Gift “a superb story!” And Fannie Flagg praises it as a “simple, yet powerful tale of a young Southern boy whose love for books guided him through difficult times of rejection into a life of love and forgiveness.” Mrs. Windham herself suggests that Ernest’s Gift is a small but important slice of local history. Published on the occasion of the Selma-Dallas Public Library’s 100th anniversary, the book is based on a true story, about a man whose lifelong love of books and reading helps overcome the hurt of a childhood humiliation. As a child in the 1930s, Ernest Dawson loved books but was denied use of the library in segregated Selma. He grew up and became a teacher, and when he passed, according to the terms of his will, a monetary gift was made to the Selma library for its children’s wing—this to ensure that children of all races had a place where they could go to read and learn. Kathryn Tucker Windham is one of America’s best-loved storytellers. Now in her 90s, she began writing as one of the first women daily newspaper reporters in Alabama. After a successful career as a journalist, she turned to writing books of ghost stories and folklore. She remains one of the most popular performers at national storytelling festivals and has been a featured commentator on National Public Radio and Alabama Public Radio. Ernest’s Gift is available from NewSouth Books, Amazon.com, or your favorite retail or online bookseller. Burgeoning online journal Chapter 16 certainly stays busy highlighting the wealth of Tennessee’s literary offerings. Launched in October 2009 by Humanities Tennessee, the state affiliate of the National Endowment for the Humanities, Chapter 16 covers books, authors, and literary events within the state. Chapter 16 also publishes original poems and essays and will soon launch a database of Tennessee authors, including biographies and links to other sources online. The journal covers a broad range of Tennessee authors, including those who’ve only lived in Tennessee briefly, as well as visiting authors appearing in the state. In advance of her May 4 event at Davis-Kidd Booksellers in Memphis, former Commercial Appeal columnist Rheta Grimsley Johnson sat down with Chapter 16 to discuss life and love, newspapers and literature, and her newly published memoir Enchanted Evening Barbie and the Second Coming. Read the full interview at Chapter 16. Enchanted Evening Barbie is available from NewSouth Books, Amazon.com, or your favorite local or online retailer. You are currently browsing the NewSouth Books weblog archives for May, 2010.